On the Adventures Cross-Country teen adventure to Thailand, students work alongside the mahout, a traditional elephant caretaker, bathing, feeding and riding elephants deep into the jungle while embarking on a journey to protect and care for these animals in their native land. Adventures Cross-Country of Mill Valley, California, is making scholarship assistance available to teens who have a yen to travel and be a force for positive change this summer. Founder’s Scholarships in the amount of $1,000 per student will be applied to program tuitions for students who meet criteria outlined by Adventures Cross-Country (ARCC) and who enroll by May 9 in ARCC programs ranging from Costa Rica to Thailand. Scholarships are available to boys currently in grades 9-12 for two programs: Thailand Elephant Service that runs July 1-31 and Costa Rica Service Ultimate that runs June 28-July 18. A third scholarship program open to boys in grades 7-9 is Hawaii Service with two departures, July 1-14 and July 18 -31. Scholarships are available to girls currently in grades 8-9 for Costa Rica Service Ultimate that runs July 16-Aug. 5 and for girls currently in grades 7-9 for Costa Rica Service Classic that runs July 21-Aug. 3. 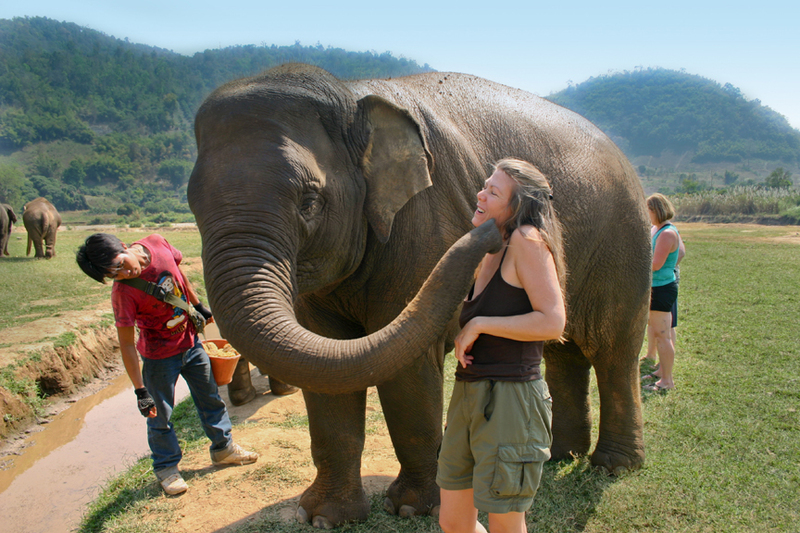 Thailand Elephant Service – In Thailand students work alongside the mahout, a traditional elephant caretaker, bathing, feeding and riding elephants deep into the jungle while embarking on a journey to protect and care for these animals in their native land. Students volunteer in a hill-tribe village, learn how to cook tasty Thai delights, spend the night among monks at a Buddhist monastery, explore the temple wonderland of Chiang Mai, scuba dive spectacular multi-colored coral reefs, whitewater raft the Pai gorges, teach English and make friendships with children in a local primary school in this country named The Land of Smiles. Costa Rica Service Ultimate – Student travelers dive into the heart of Costa Rican culture by working with school children and rural farmers on community service projects. Enroute they whitewater raft through the jungle on the Pacuare River, surf an unspoiled coastline, patrol turtle nesting beaches, help a community build a shelter, do daily chores with a family and help educate village youth. Costa Rica Service Classic – Students teach English in a local school, whitewater raft through the jungle on the Pacuare River, engage in conservation and ecological preservation, come together with a rural community to build a shelter, plant a vegetable garden, explore lush rainforests, untouched beaches, and a rainbow of exotic wildlife, and surf the friendly waves of the Pacific Coast. Hawaii Service – Students traveling here engage in a celebration of a landscape of perfection, where the beauty of turquoise waters melt into captivating sunsets. Enroute they engage with communities in helping preserve natural and cultural environments while sharing a laugh with local children at a Boys and Girls Club, surfing, swimming and hiking the magnificent Na Pali coast. Founded in 1983, ARCC has become a leading provider of Community Service, Service Learning and Adventure Travel programs for youth ages 13 to 19. For over 30 years ARCC has been offering life-changing experiences to students who participate in two- to four-week small group programs that visit 21 countries on six continents. From teaching primary school English and building water purification projects in Africa to running whitewater rapids in Costa Rica to enhancing fluency in Spanish or Mandarin in Spain or China, ARCC brings youth face to face with the challenges, realities and beauties of nature and our global community. For post-high school students ARCC operates Gap Programs in Africa, Asia and Latin America. These offer an educational and cultural bridge between high school and college combining a rich academic curriculum with the experiential benefits of international travel. Adventures Cross-Country’s 50-page catalog details Community Service, Language Immersion and Multi-Sport programs in 21 countries on six continents for youth seeking a summer service learning experience, all while exploring cultures and communities off the beaten path. The full catalog in a digital version can also be viewed online (415-332-5075, www.adventurescrosscountry.com).